More than 130 workers from Country Financial will move from Arden Hills to new offices in downtown Minneapolis. The insurance and financial services company, which is based in Bloomington, Ill., said in a statement Wednesday it plans to move into the newly renovated Fifth Street Towers in November. Employees from the information technology, underwriting, claims, and enterprise procurement departments will occupy the 16th floor in addition to half of the 15th floor. “We’re excited to move into our new space because employees will have access to many new amenities, and we will be able to attract future talent and accommodate growth,” said Chris Stroisch, a spokesman from Country Financial. The company will have about 30,000 square feet of space in the office complex, which is located on 5th Street between Marquette and 2nd avenues. Renovations of the towers, which rise 25 and 36 stories tall, were completed last fall. 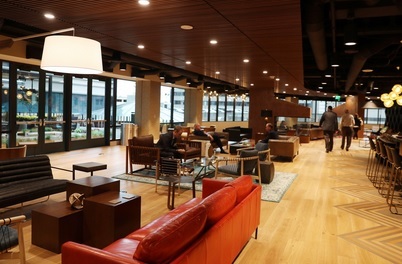 Improvements included a new amenity floor, skyway bar and updated lobby finishes.